Profiles of great people I've met over the years who are making a difference with the world's children and youth. The sneaker in the photograph above was one of the most meaningful gifts ever given to me. My friend, Peg Herbert, brought it back to Canada from Lesotho, and presented it to me as a reminder of how our school district’s seemingly small contributions brought tangible comfort to children who suffer. A Basotho boy had been wearing this sneaker in his daily march over the mountains to get to school. His feet had long since outgrown his shoes, but these were all he had. Help Lesotho, through financial aid from Canadians like us, had been able to provide this boy with a new pair of sneakers, something my own children had come to take for granted. Every gift helps, Peg kept telling me, but I didn’t grasp the truth of this statement until I saw this little misshapen sneaker, laces missing, tongue fallen off, and a hole in the toe so big I could put my fist through it. I often think of that when confronted with the magnitude of the AIDS crisis in Africa, and our lack of capacity to solve the entire problem. How can we feel good about our contributions, when so many are left hungry, cold and suffering? 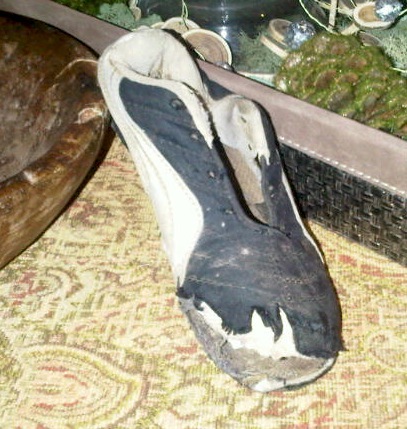 So many children are wearing beaten up shoes, like this one, or no shoes at all. This week I read a tweet from The Elders, which quoted Bishop Desmond Tutu as saying: “God doesn’t count the way we count – helping just one child brings joy to God’s heart!” This statement resonated with me, and I think, for the very first time, I understand how it is that beautiful people like Peg Herbert are able to sustain their energy in performing true acts of goodness while they encounter such human suffering, day after day after day. On May 28 our school district will be holding a “Chari-Tea” in support of Help Lesotho. Please support our efforts to help Peg with her important work. I think of the child who once wore my cherished little sneaker. He must be growing still, and I wonder what he’s wearing on his feet as he struggles through life, as he journeys through the horrible AIDS catastrophe in Lesotho. Thank you, Peg, for your gift. The story of a Basotho child’s sneaker is truly inspiring!